Market Force Reviews - Legit or Scam? Market Force Reviews – Legit or Scam? 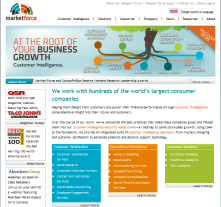 Market Force, at www.MarketForce.com, is a company which uses something they call “customer intelligence” to help multi location business owners please their customers and orient performance in an efficient and profitable way. Market Force defines customer intelligence as a “new, emerging methodology” for insight into your customers’ experiences in your store, as well information on the stores themselves, and your finances, and most importantly, how the three interact. They claim that they will use advanced analytics to determine what store level changes will impact your finances the most. As part of their intelligence gathering system, Market Force employs Secret Shoppers and Certified Field Associates on a paid, part time, flexible basis. Mystery shoppers are assigned to go to a wide variety of retailers – such as gas stations, grocery stores, restaurants, or banks – to basic shopping tasks and then report back on the customer service, product selection, cleanliness, or other specific information sought by the assignment. Mystery shoppers are either paid for the assignment they complete, or they are reimbursed for the purchases they made while on the assignment. For example, if your assignment is to evaluate service at a restaurant, often you will be reimbursed for your meal instead of paid for completing the assignment. Market Force also employs what they call Certified Field Associates (CFA), who are different from mystery shoppers because they perform different types of assignments, such as checking store displays, whether a specific item is in stock, or head counting in movie theaters. CFAs are paid for all assignments they complete successfully, as well as potentially qualifying for reimbursement for tickets and concessions for certain movie theater assignments. With Market Force, you can sign up to be both a mystery shopper and a CFA. If you are interested in signing up as a mystery shopper or CFA with Market Force, you’ll have to 20 years old with at least a high school education, as well as a computer with high speed internet access. Some jobs will also require you to have a digital watch and/or a digital camera. It is free to apply to Market Force, and your application will be evaluated within 48 hours of submission. If you are accepted, you will be contacted by email. But it is important to note that if you are accepted, you will not be an employee of Market Force. Rather you will be acting as an Independent Contractor, which has different tax requirements that you should know about beforehand. Average Rating for " Market Force " is 2.24 out of 5 based on 17 reviews. So how exactly does it work anyway? Will they have you go outside of your city? Do they send you a check as payment or a direct deposit, or what? Thanks for all who posted (I only checked this forum after I competed the application)- Did the application today based on a review by a seemingly reputable site. Started to smell a rat that they just want my details in order to sell on to third parties rather than my opinions on things. The website is simply not geared as a successful entrprise should be - I am leaving ASAP and hopefully removing all information I have left. My first mystery shopper review is of this company and their processes - leave well alone!! Enough said!! I have been doing Mystery Shops and audits for Market Force since April 2018. No complaints - not a scam. Have not received emails indicative of Market Force selling my info. I have earned over $300.00 - average of about $15 and up as an hourly wage - completing shops in my spare time. I have also been reimbursed for any money spent for services/goods/meals, which means I have earned a wage and been reimbursed for meals necessary for the shop. I recommend Market Force as a way to add income while setting your own hours. This place is a complete scam. They retired to get me to deposit a check for Over $1500 to my account and send some Walmart to Walmart money transfer. Lol I reported them to the FTC. Check fraud is a federal offense. No bank in NYC would even touch this check. Stay away from them. I'm also reporting them to the news stations. This crap had to stop. Thank you, my friend said she got a package from them with two checks in it and the bank said they were legit, thank you so much for the info, I have to tell my friend to beware. Thank you so much. She did not deposit them at all. Have completed evaluations for Market Force and Certified for about ten years. Interesting assignments. Pay very fast. All shop reports are done on line. Have a very easy invoicing system. I have been working with them for almost a year now doing theatre checks, blind checking, and other movie associated assignments. I have always received payment (it does take about a month to get paid). I've spent an entire day at a theatre on Saturday and made over $150. The basic prices for checking range from $7.00 up to $18.00 as they some times give bonuses for certain assignments. There are always projects open in my 49 mile radius (Farthest you can search for assignments) and they are prompt on providing very detailed instructions and when the assignments need to be submitted by. I would not recommend this as a full time job, but for an extra $150-$200 per month it is defiantly worth a look. When you accept an assignment you receive a letter to present to the management on site to allow you into the movie free of charge. There are covert assignments also where you purchase your ticket in cash and they reimburse you at time of payment. The assignment sheets they send you are VERY specific on what they are looking for. It might not seem like it on the basic assignment screen, but once they send you download the paperwork it gets into detail as to your assignment. I signed up with them a while ago, but haven't done an assignment yet. A few of the listed assignments are vague as to what they entail and how you go about doing them. For instance, if you are checking trailers or anything that requires you in the actual movie theater, do you have to purchase your own ticket or does the theater just allow you to go in and do the checking? Any insight of actual work assignments would be appreciated. I am missing a payment of over 200 pounds. It was supposed to go into my bank account but it didn't quite reach it. After numerous calls the manager finally spoke to me. I have to email the head office in America, but have been informed that the payment sometimes bounces back to Marketforce. Just hoping it will bounce back where it belongs into my bank account. Will give an update about this. I have been trying to complete their application process for the last two days, but keep getting an error that says "We’re sorry, we are experiencing technical issues and therefore you can’t complete your application at this time. Please try again later. We’re sorry for the inconvenience." I have checked back at least ten times over the last two days, sometimes 10 minutes later, sometimes 3-4 hours later. Sometimes I'm able to get a little further in the process, but often have had to re-enter information I already entered. Their application process has not instilled a great deal of confidence in me, and after reading online reviews I don't think I want to be associated with this company anyway. I have wasted a good couple of hours of my time and have nothing to show for it. I'd recommend against it. I did to and had to call them back but now I'm worried that I may have been scammed by someone pretending to be them and am very worried. I have been a mystery shopper with Market Force since 1984 and have never had any problems whatsoever. It does take about a month to get paid, but I ALWAYS got paid for the shop and reimbursement. Yes, there are times that if an assignment is not done correctly or you don't follow instructions you may not get compensated. These people do their very best to not pay you for the "intel" you provide them. I am very very disappointed in their poor performance and lack of direction/care for new people. I spent money twice that I'll never get back, and with the poor payments they provide, it would take a very long time before any money I would get from them would break me even. SAVE YOUR TIME AND MONEY, FIND A REPUTABLE ORGANIZATION TO AFFILIATE WITH.